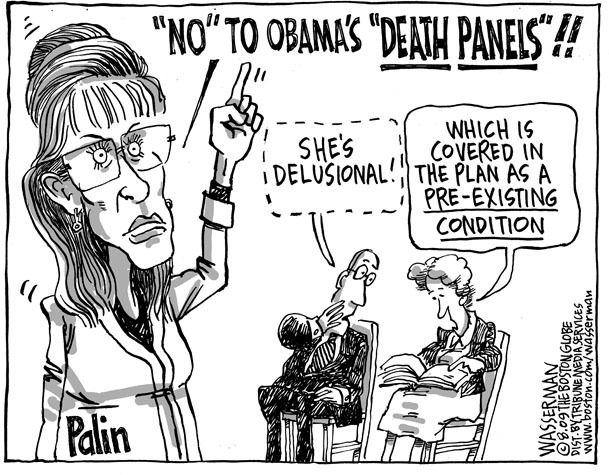 Palin and “Death Panels” cartoon from the Boston Globe. Starting with a news clip of Sarah Palin talking about death panels on Fox News is a sure-fire way to gain the attention of your audience. That’s exactly what Dr. Phillip Rosoff did to ease into his more serious talk about the ethics of rationing health care in the United States. He spoke to a crowded audience of clinicians, ethicists, and students for the Trent Center for Bioethics, Humanities, & History of Medicine lecture series. Dr. Rosoff discussed both moral and economic reasons why we need to ration healthcare in the United States. For one, health care costs are bankrupting the nation and taking money from other social goods. According to Dr. Rosoff, our health care system is expensive, inefficient and has astounding disparities in access to quality care. “Health care is not the only good. Other factors contribute to our ability to live a good life, including education and the arts,” he said. “The key to rationing isn’t saying ‘no,’ but how it’s done,” he said. He unveiled his vision for a better model of health care. In his eyes, a single-payer system that would eliminate the centralized profit motive – where physicians and hospitals have the perverse financial incentives to sell things – would decrease costs without compromising quality. He believes that a similar, expansive, generous benefit plan should be available to all, and those who make the rules ought to be bound by them. Problems arise when people make decisions for others without being affected by the outcomes, Dr. Rosoff explained. He referenced the organ transplant waiting list, UNOS, as an accepted system where most patients do not complain about bias or unfairness because they realize that everyone has been given a fair shot. The same should be true of our reformed health care system: there should be no “VIPs” or “VUPS” (very unimportant people) and steps ought to be taken to ensure that everyone with a similar clinical prognosis should be bound by the same rules. While it may seem impossible to increase coverage while lowering costs, other countries provide high quality care at a fraction of the cost, Rosoff explained. Twenty five percent of our spending in the U.S. goes towards unnecessary treatments or administrative expenses. When asked what the rallying cry for such a major change in the health care system would be, Dr. Rosoff said that the system as it is will bankrupt us, so changes need to be made. At the same time, we need to avoid evoking the scarcity principle, drawing as little attention as possible to changes being made, he concluded.